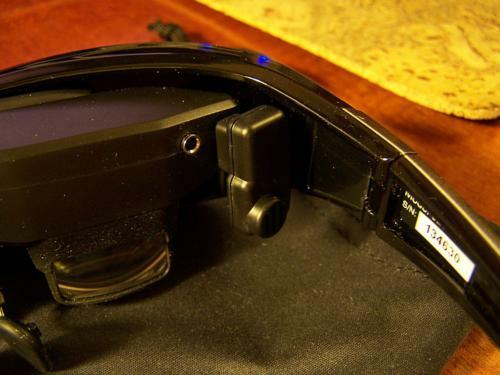 Recently I got my hands on brand new Vuzix video-see-through augmented reality HMD – Wrap 920 AR. It’s not quite a consumer product, it’s more focused on R&D in Augmented Reality field, there are small amount of information about it on the net and few people asked me for a review. Besides, I hope it will be interesting to many VR geeks on the planet, so here it comes. I want to give as much info as I can, but will try to keep this article short and don’t miss anything valuable. Wrap 920 AR comes in really big box in comparison to compact package of VR920. Honestly, I didn’t expect it to be so big, but it’s because of bunch of different stuff inside, all packed in different sockets cut in safety foam. You can see list of included stuff on the sign, on top of the box. I liked that each part of the package is wrapped in some packet; head-tracking module comes in small acrylic box for example. Two AR markers on plastic-base included, which is nice to check Vuzix AR demos right away. Drivers for the HMD are digitally distributed by Vuzix via Internet, so no installation disk is included. Wrap 920AR based on Wrap series of Vuzix HMD’s, and as any other Wrap HMD it supports various video sources for input. It’s includes composite video, iPod / iPhone connection and what we interested in – regular VGA for PC connection. To use VGA or composite video source you need to choose proper “adapter”, which are actually a control boxes. All currently available adapters (VGA, composite / iPod) included in the package of Wrap AR. Vuzix recently announced Wrap HDMI adapter, so I’m pretty sure it will be compatible. There’s also DVI to VGA adapter in the package for DVI-I connection. Wrap AR HMD have two cables, one from visor system (HMD itself) with some small specific connector which goes into control box, and another one from stereoscopic camera system – regular USB. VGA control box have VGA and USB connectors. USB needed to power up screens, provide audio and head-tracking. Before start to work with Wrap 920AR in its full capacity we need to attach head-tracker, VGA adapter and optionally headphones. From the inside HMD have two small jack connectors for ear-plug style headphones and micro connector on the right brow for head-tracker module. Tracker connector and HMD-to-control-box connectors are very small, and looks fragile, so I would recommend assembling these with care, because they do need to put some force to plug in. But once connected, tracker (and control-box connector) securely stays in place, and don’t bother you. Wrap AR had straight-forward connection to my netbook and laptop, just plug in VGA and both USB cables and it’s ready. But first thing I noticed when tried to connect them to my (most powerful) stationery computer that cables are way to short! Cables are much shorter than what was in VR920. I suppose Vuzix designed glasses to be connected to laptops, which sounds reasonable for Augmented Reality usage. Besides, in the full PDF manual (more than 100 pages!) I found mention that for stationery computers additional extension cables are need to be used. In short – I used 3 meters VGA extension cable and two 2 meters USB cables to connect Wrap AR to my stationery PC, and in this configuration device work without any issues. After connecting HMD, drivers were installed fluently on both systems: Windows XP 32 bit and Windows 7 64 bit, I also tried them on Windows Vista 32 bit, without any problems. HMD supports input video signal with resolution up to 1024 x 768 with 60 Hz refresh rate. It can be used both in clone and extend monitors modes like any external monitor. Once connected to PC (and drivers are installed), buttons on the control box (adapter) provide control to the HMD adjustments menu. In the menu you can switch between few brightness and contrast presets, set your own preset, switch between stereoscopic and monoscopic modes, switch between different stereoscopic modes (side-by-side stereo pair, or various anaglyphs), swap left and right eyes in stereo mode, and adjust headphones volume. On the back of the adapter you can find a little screw-driver, which is needed to adjust focus. Two knobs for focus adjustments you can find under rubber cover on top of the HMD. Knobs allow you to adjust between +2 to -5 diopters independently for each eye. My Wrap AR when first unpacked and connected to PC, had both knobs set to the very left position, I believe it was -5. I have perfect vision and was completely unable to focus screens this way. But with step-by-step slight adjustments, independently for each eye I was able to set glasses to very comfortable focus, and both “eyes” give me a sharp and clean image. Also nose-piece can be adjusted for particular nose, and all nose-piece construction can slide inwards (or backwards) into HMD. Additional (spare) nose-piece and ear-plug nozzles of different sizes also included in the package. It is possible to adjust optics between -5 and +2 diopters, but if you happen to have worse vision, you can find that it’s hard to use HMD with glasses while head-tracker attached, so probably you will need to use contact lenses. Personally I found Wrap AR to be pretty comfortable, HMD is easy to wear and lightweight enough. Wrap 920 AR have two true 752 x 480 LCD color screens which are located inside visual module casings and project image down into lens/prism system. In Wrap predecessor – iWear VR920 screens were located in front of the eyes, here Vuzix decided to go with another optical design. Optics has narrow 31 degree diagonal FOV with 100% stereo overlap, pretty much the same as with VR920 (32 degree), personally I didn’t feel the difference in the image size, but of course I would prefer if FOV was bigger, at least like in old VFX-1 with 45 degree. All surroundings from the sides and from the bottom of the screen can be clearly seen, so it doesn’t block your view. This is bad in case of Virtual Reality use, but can be good when it comes to Augmented Reality applications, because you still see and aware of your surroundings outside of the screens, and on the screens, and in the same time inside screens you can see all AR “magic”. In comparison with VR920, picture quality inside Wrap 920 is much better! Picture is perfectly clear and sharp, and looks the same in both eyes; also color reproduction is much better. As many of you know, iWear VR920 had “child problems” with screens system – image in left eye looked a little grainier (less colors) then from the right eye. When used for long periods of time – VR920 was able to overheat, and when that happened – image quality degraded, user begin to notice “scan lines” and even in case of extreme overheat, many users noted “black dot” which appeared in corner of the screen. Those artifacts thankfully weren’t permanent, and after cooling down HMD by unplugging USB chord image became normal again. Wrap 920 AR don’t have any of these “child problems”. Glasses stayed almost all working day plugged into my laptop and just became normally warm. Image quality doesn’t change, so it’s really good that Vuzix solved such issues! 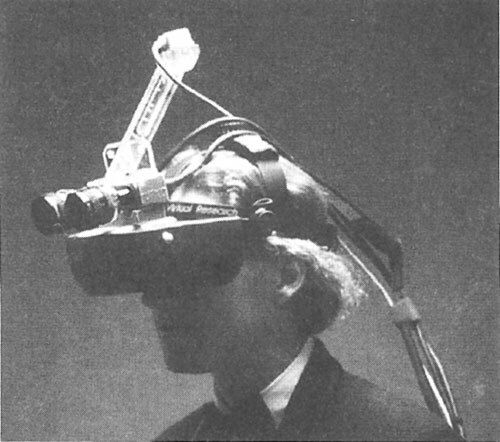 This HMD can be plugged and powered on as regular monitor as long as you wish. Also, from the first try I thought that my Wrap AR have bigger resolution screens. What I mean is when desktop is set to 1024x768 mode normally in VR920 I wasn’t able to read any standard-sized text in Windows, in Wrap AR I can operate Windows almost normally, text isn’t perfect but it’s readable in all the menus. Perhaps its benefit of better optics, higher quality screens, and better image scaling algorithm, but fact that picture is pretty readable even in 1024 x 768. Main stereoscopic mode of Wrap 920 AR is side-by-side stereo-pair (it can be parallel or cross-eyed, both modes supported), which is very good from developers point of view, because it’s fairly easy to implement. But, in fact, gives less resolution per-eye. So if Wrap 920 AR is working in 1024 x 768, effective pixels will be 512 x 768 per eye, each scaled to 752 x 480 screens. What is good that both eyes will be perfectly synchronized, and you can give full 60 frames per second for each eye! 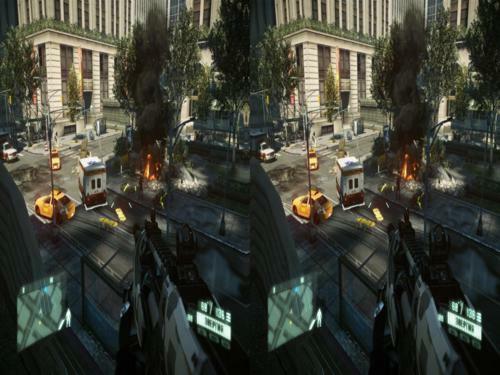 Stereo-pair support make glasses perfectly compatible with iZ3D and TriDef Ignition stereo-drivers, besides some new games like Crysis 2, and Avatar can output stereo-pair natively. For those who compare characteristics to VR920, it had limitation of 30 FPS per eye in stereo, because of page-flipping stereoscopy; Wrap series don’t have such limitation. Wrap 920 AR have two high-speed micro-cameras with 640 x 480 native resolution, which are actually capable of 60 frames per second (if your computer can handle). 60 Herz refresh rate gives really nicely smooth and almost perfect picture of the surroundings, which looks really good in stereoscopy! In Windows Wrap AR camera system recognized as two independent USB cameras. I’ve compiled small example from Vuzix SDK to check stereo cameras, and tried to make a photo to give you some impression of how it looks like. In reality picture in glasses looks really nice, and it blends good with surroundings. FOV of the cameras and screens optics FOV fit close to each other (not ideally, but close enough to give you proper illusion), which is good point for AR. Picture quality of Wrap AR cameras not as nice as in new top-line Logitech webcam’s for example, but far better than most regular webcams can provide, and they work very fast when PC can handle it. Besides, exposition, white-balance and other stuff manually controllable from the camera drivers. They are also can be controllable from the inside of self-made software using Vuzix SDK. New Wrap 6TC head tracker besides 3 accelerometers and 3 magnetometers also includes 3 gyroscopes, which greatly improved orientation tracking when comparing it to VR920 head-tracker. It’s much less dependent on external magnetic influences, and do not require frequent re-calibrations. In fact I’ve calibrated them only once, and tracker work fine even week after, without any recalibration. Using SDK we can receive full 6DOF information from the tracking. In this mode absolute 3DOF orientation information provided (Yaw, Pitch, Roll), along with relative 3DOF position (X, Y, Z). However Vuzix notes in current SDK that position info is in early beta and can’t be used for anything serious besides just “movement” detection. True I didn’t figured out how to use those X, Y, Z values with current driver and SDK, they seems pretty chaotic, but hopefully they will be useful in future with next drivers release. Wrap 920 AR drivers supports Windows XP, Vista and Windows 7 both in 32 and 64 bit versions. Wrap 920 AR shipped with “maxReality” license, which is an AR plugin for 3D Studio Max (2010 and 2011). I didn’t use this software so far, because I plan to use these glasses with my own software, but maxReality have few nice demos, which can be used to check all functions of Wrap 920 AR. I’ve captured movie examples of Vuzix “Dragon” demo, these movies are stereoscopic, so you could take a look how it actually looks like in HMD on your stereo-setup (please watch in HD). Also Wrap AR is fully supported by Vuzix VR manager software, which provides stereoscopy and head-tracking for more than hundred of gaming titles. Even if it’s isn’t gaming HMD, nice to have this feature. Free to use SDK with C++ examples available from Vuzix website to give programmers ability to use any feature of this HMD including head-tracker, stereoscopy, cameras, and also optical marker tracking example based on ALVAR library. SDK is well documented and examples are good to use. Some of the statements in this review can be fair for other HMD’s from Wrap series (like Wrap 920) its goes to stereoscopic support and head-tracking module. Some other statements can be close too, but I can’t 100% guarantee that, because I’ve used only AR version, which is a little different even externally from other Wrap HMD’s, and also can be a little different in electronic components which used in it. If you happen to build your own Augmented Reality software, or you make research and development in this field, and you have a budget on Wrap 920 AR, I would say go for it! It’s nice lightweight HMD which provide true stereoscopic video-see-through. It is ready to use hardware solution. I happy I bought it for my projects. [scrollGallery=id:29;]Wrap 920AR besides VR920 modded with Logitech HD C310 webcam into AR glasses.